Let's analyze all the steps involved in the creation of this drawing. Right off, let's make a reservation that the following sequence of creating a drawing could seem somewhat irrational to an experienced user. This is done on purpose, to make the comprehension of the essence of optimization more intuitive. As we can see it on the figure, our detail is symmetric relative to the central horizontal axis. That means this sketch can be obtained by reflecting the upper part of the object from that axis (using the MIRROR command). First, display two center lines, horizontal and vertical. Next, draw two concentric arcs centered at the point formed by the intersection of the two center lines. 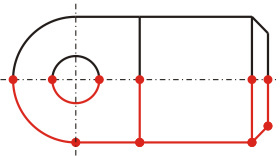 Using the LINE command, add two more lines (vertical and horizontal) to the drawing. The result of our drawing is shown on Figure 2. 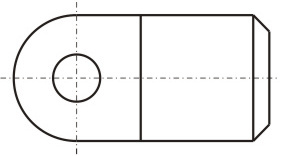 On the second stage of the drawing, use the MIRROR command and reflect the upper part of the detail from the center line. How many objects have we used for creating our drawing? Take a careful look at Figure 5. It shows detailed (with different colors) objects our drawing is made of. Thus, we have obtained a new, optimized drawing that consists of 7 lines, 1 arc, and 1 circle. The creation of the drawing has engaged 9 objects, which is 7 objects less than what were engaged in the original drawing. So, even on this simple sketch we have identified and eliminated over 40% of excess graphic content! Needless to say how many of such "extra" objects can reside in our drawings, making those way greater by the size than the given example. For the final stage of optimization, we will convert our drawing into polylines. Practice shows that after converting objects into polylines, the size of a drawing tends to be reduced in average by 10...20%, and in certain cases it is possible to achieve 30-percent reduction of the original drawing size. 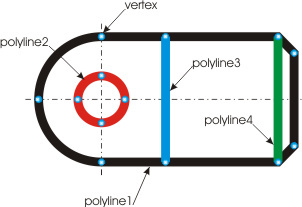 The so-called "packing objects into polylines" (in other words, conversion to polylines) was made possible by TotalPurge's internal high-performance algorithm for smart conversion of objects into polylines, which converts filleted entities into open and closed polylines of the LWPOLYLINE type. For more information on the entity to polyline conversion mechanism, please see "Converting objects into polylines". 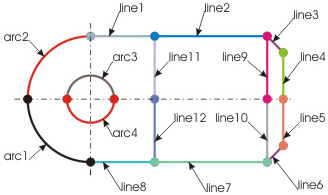 As the figure shows, after the conversion into polylines, we come from 9 to only 4 objects, which are 2 closed (polyline1, polyline2) and 2 open polylines (polyline3, polyline4). At the same time, please notice the smallest possible number of vertices engaged in the creation of the polylines. After the last transformations of the drawing, we have managed to additionally (by over 50%) reduce the number of objects used for its creation. Note. The conversion of circles into polylines is not always appropriate. That is due to the fact that a polyline obtained from a circle basically consists of two arcs, and editing those, when necessary (e.g., after using the EXPLODE command), is slightly harder than editing the original circle. 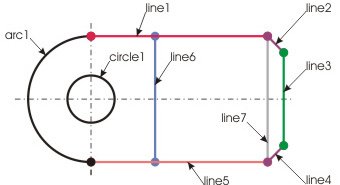 The conversion of circles into polylines is usually justified only when the original circle must obtain a visual thickness or for some other reasons. Therefore, before you begin, check your polyline conversion settings for presence (or absence) of the selection by the "Circles" column (see "Settings"). The software analyzes selected objects. It identifies series of objects to be optimized. It replaces complex series of objects with simple entities. If necessary, it converts (packs) objects into polylines. It re-draws the drawing with new objects. Reduces the number of graphic objects in a drawing. Essentially facilitates further handling of it, reading it and analyzing it. Reduces the size of the original drawing file . Frees your computer's RAM from unnecessary data. And, as consequence, increases the efficiency of your work.